What’s greater than receiving a package in the mail? Receiving one from H&M! I mean even though I ordered and purchased these items myself, unboxing is still fun! The kids also love opening and receiving packages too, wonder where they get that from?! This time around, I ordered a few things for the boys. 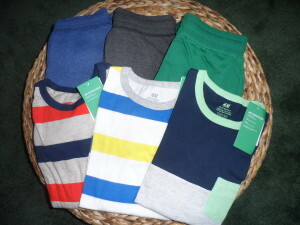 I love a great basic tee and sweatpants for them. These are easiest for those days when you need them to dress quickly. The tees are sooo soft, made of organic cotton and are at a great price point. The H&M sweats are my fave ones, because they taper toward the end, giving that hipster vibe for the kids. 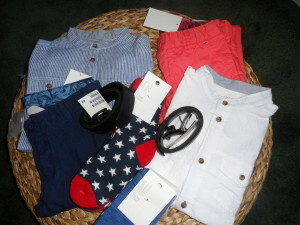 I also ordered a pair of dress pants, dress shirt, socks and belts for them. These are considered their “dress” clothes, something they would wear to church, a party, for pictures, etc. Once again, H&M quality is superb, these pants can last many washes and won’t fade or lose their luster. This is important to me when purchasing kids clothing.